The frogmouth a group of nocturnal birds related to the nightjars. They are named for their large flattened hooked bills and huge frog-like gape. The Philippine Frogmouth (Batrachostomus septimusis) is an endemic species found throughout the Philippines. The ones in Mindanao are of the nominate subspecies septimusis. In May 2014, I had a chance to see this species while on a trip to PICOP, Mindanao. In an inconspicuous part of a dark patch of forest, sat a lone upright figure than was motionless and could pass off as another stick. The Philippine Frogmouth sitting on at the end of a horizontal branch with 4 side branches projecting out. The mound it sits on is the nest that consist of its own downy feathers which is held in place using spider silk, moss and lichens. An on it presumably sits a single egg. 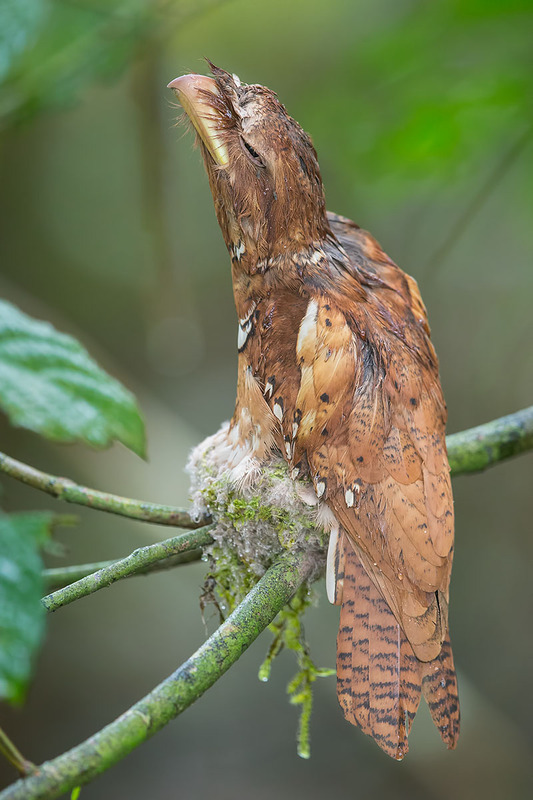 This entry was posted in Birds, Travel, Wildlife and tagged Mindanao, Nesting, Philippines, Philppine Frogmouth, PICOP on July 7, 2014 by Francis Yap. One of the places I visited while in Mindanao, Philippines was a place called PICOP. It stands for Paper Industries Corporation of the Philippines. As the name implies, it was a logging site that produced paper and other timber products. It has long since been closed down and the forest now is unfortunately being decimated by other factors. Nonetheless, it is still an important site to get a lot of endemic Philippines birds. One of the endemic bird there is the Everett’s Scops Owl (Otus everetti). It is a recent split from the Philippines Scops Owl, and the outskirt of the town of Bislig is apparently a good place to find it. At dusk, we arrived at a nondescript place with a patch of secondary forest, a road, and nearby some sort of worker’s compound. The place did not seem like much, but we were assured that the bird has been spotted here before. Once the place got dark, the guide started playing the call of the owl to attract its attention. Minutes passed by, and then some more. Nothing. Motorbikes passed by every now and then. Mosquitoes abound and took a liking to us, and it looks like the guide was getting quite nervous. I was getting a bit impatient. It must have been at least 15 minutes and the place was really dark when suddenly a flash of a bird flying pass. Everyone scurried to the landing place and the torches were aimed squarely at the owl. No one made any noise save for the rapid shutter sound from the cameras. This entry was posted in Birds, Reptiles, Travel, Wildlife and tagged Bislig, Everett's Scops Owl, Feeding, Parachute gecko, Philippines, PICOP on June 29, 2014 by Francis Yap. The Giant Scops Owl (Otus gurneyi) is an endemic owl of the Philippines. Also known as the Mindanao Eagle-Owl, it is intermediate in size and structure to the scops and the eagle-owl. It is a threatened species due to habitat loss but little is known about it’s biology and behaviour. On my trip to the Philippines to see the Philippines Eagle nesting in Mindanao, I had an opportunity to encounter this bird. While staying in a resort near Davos, our bird guide mentioned that he will be looking for this owl species at the resort itself in the early hours of the morning as he had heard its call on a previous trip. If he succeeded, he will wake us up immediately to get a view. We thought little about it, and proceeded to sleep peacefully that night. In the middle of the night I was rudely awaken by some shrieks just outside my chalet room. I thought what an awful noise made by some unknown animal and try to get back to sleep. Just then, the phone rang, with our guide informing us that he had seen the bird. Without much preparation and just with my bare camera and lens, I rushed out to meet the guide who was shining his torchlight at a short distance away. This entry was posted in Birds, Travel, Wildlife and tagged Giant Scops Owl, Mindanao, Philippines on June 27, 2014 by Francis Yap.